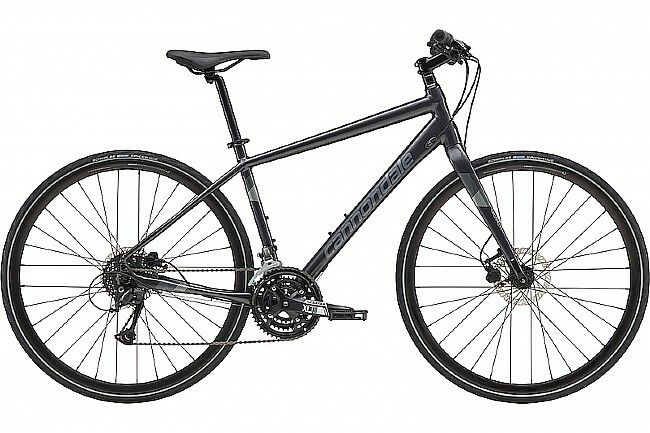 Cannondale's 2019 Quick 4 Disc is a lightweight, versatile bike with hybrid -- upright yet athletic -- geometry that adapts easily to your needs, whether you're commuting to work, bar hopping, or logging a high-intensity work out. Shifters: Shimano Altus, 3 x 9. Front Derailleur: Shimano Altus, 31.8mm clamp. Brakeset: Tektro M275 hydro disc, 160/160mm. Saddle: Cannondale Quick Ergo Performance. Axles: 12 x 100 thru axle (front); QR (rear). Tires: Schwalbe Spicer Tires, 700 x 30c.